The Catalogue of Jewish Ossuaries (CJO) lists three ossuaries with the name MRYH inscribed on them (CJO 152, 706, 796). Dominus Flevit lists two ossuaries with the same name (DF Nos. 7 and 34). Here, the name “Mary” is inscribed three times on the same ossuary, all three times as “MRYH,” and all referring to a single individual. ‘MARTHA AND MARIA.” Again, the name “Mary” is listed three times on the same ossuary, once as “MRYH” and twice as “MRYM” (as noted yesterday in Part 1 of this series). This ossuary is noteworthy for several reasons. First of all, we can see that the inscription actually reads “MRYH SHM’WN”, not “QRYH”. The transcription in CJO is in error; there the final mem used as the first letter of MRYH has been misread as qof. Note the similarity with CJO 706 (above), where the initial “M” is the same form as that used here. Secondly, the second name “Shim’on” has actually been deliberately scratched out. The last letter in this name (which is clearly “Shim’on”) provides a clear parallel to the final nun on CJO 243, the ossuary of MRYN, discussed yesterday. At first glance, the reading “QRYH” is seemingly feasible. However, a closer examination of the inscribed ossuaries indicates that the more likely reading is “MRYH”. 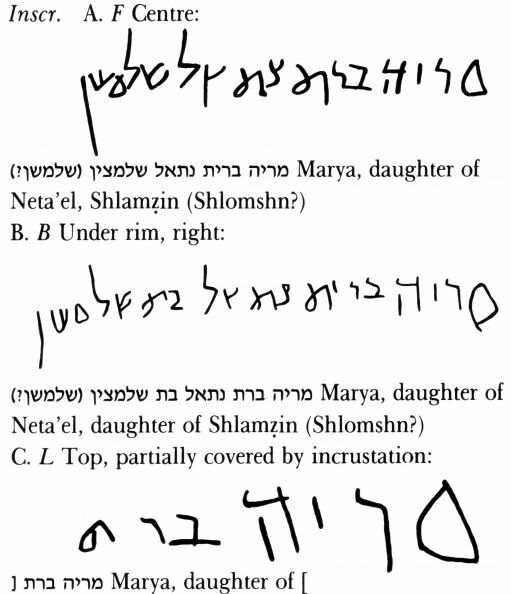 A comparison of the first letter of the name with the unquestioned mem of “Shim’on” in the previous inscription (CJO 428), establishes the case for “Maria”. A summary census. Thus far in this posting and the previous one, we have surveyed all the occurrences of the names MRYH (Maria) and MRYM (Mariam/Miriam) in two published collections, that of the Israel Antiquities Authority (CJO) and that of Dominus Flevit (DF). We have noted all occurrences of the names listed in the catalogues, reviewed each one, and made corrections, in some cases eliminating an ossuary reading and in others adding a previously unrecognized Mary or Mariam. This is not a complete census of named ossuaries, both published and unpublished, but represents a credible sampling of the existence of these two names, based upon the largest published collections, CJO and Dominus Flevit. The present count of the names among the inscribed, catalogued ossuaries is MRYH 10x; MRYM 8x. If one takes into account only the census of ossuaries with one identified person per ossuary (CJO 796 and DF 7 each contain only one individual whose name is written 3 times), then the actual count would be MRYH 7x; MRYM 6x; mixed MRYH/MRYM 1x. Along with the Greek and Latin forms of these names, whether MRYH, MRYM, MRYN, MRYWN, etc., “Mary” was one of the most popular, if not the most popular, name given to a daughter during the Second Temple Period. In this survey of the ossuaries, it is noteworthy that MRYH “Maria” has a slight edge over the use of MRYM “Mariam/Miriam”, a preference that is similarly reflected in the literature of the period. 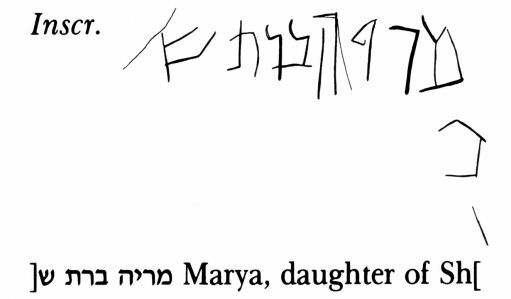 And if this survey illustrates anything, it is that the writing of Maria/MRYH in Hebrew was anything but rare. MARIA (27x) and MARIAM (27x) in the New Testament! At surface glance, Mary, the mother of Jesus, and Mary Magdalene were called by both names in the New Testament. However, on closer examination, it emerges that the individual authors preferred to use one name over the other. Matthew prefers MARIA (4x, infancy narrative) to MARIAM (1x, as called by the townspeople of Nazareth). Luke prefers MARIAM (11x) to MARIA (1x; all occurrences in the infancy narrative). Acts uses MARIAM for Jesus’ mother (1x). Mark uses MARIA for Mary the mother of Jesus (1x). John intentionally avoids her name (cf. John 2:1, 3, 5; 19:25-27). Mark uses only MARIA (4x). Matthew uses MARIAM (2x) and MARIA (1x). John uses MARIA (3x) and MARIAM (2x). Matthew uses MARIA 2x for Mary of James and Joseph and 1x for the “other Mary” at the tomb. Luke uses MARIA 1x for Mary of James. Luke uses MARIAM 2x for Mary of Mary and Martha. John uses MARIAM 8x and MARIA 1x for Mary of Mary and Martha. John uses MARIA 1x for Mary of Clopas. Acts uses MARIA 1x for the mother of John Mark. Paul uses MARIA 1x for a Mary of the Church at Rome. What does this data tell us? Most importantly that, in stark contrast to the claims of the producers and writers of the “Lost Tomb of Jesus” and the “Jesus Family Tomb”, Mary the mother of Jesus is most commonly known as “Mariam” in the New Testament, and Mary Magdalene is most commonly known as “Maria”. This would lead one to expect that should their tombs be found and verified one day, they would be inscribed accordingly (i.e., that of Mary the mother of Jesus as “Mariam” and that of Mary Magdalene as “Maria”–the opposite of the ossuaries from the Talpiot tomb). Or perhaps one would even find both forms of the name, as in the case of Dominus Flevit ossuary inscription number 7! Say it soft and it’s almost like praying. Maria! I’ll never stop saying Maria!